Strawberry low-fat yogurt and JELL-O Strawberry Flavor Gelatin make a luscious base for this berry- and cookie-topped dessert. Mix yogurt and dry gelatin mix in medium bowl with whisk until blended. Stir in COOL WHIP; spoon half gelatin mixture into 6 dessert dishes. Top with half each of the remaining ingredients. Repeat layers. 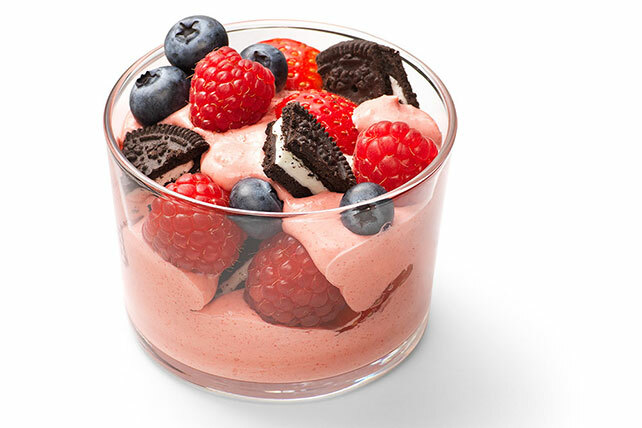 Save 100 calories per serving by preparing with strawberry nonfat yogurt, 1 pkg. (0.3 oz.) JELL-O Strawberry Flavor Sugar Free Gelatin and COOL WHIP LITE Whipped Topping. Try our Healthy Living version of JELL-O Fruit and Cookie Dream. Prepare using whatever cut-up fruit you have on hand, such as melon, pineapple or peaches. Use 1 pkg. (3 oz.) JELL-O SIMPLY GOOD Strawberry Flavor Gelatin.